Here we are with another batch of living room ideas, all of them featuring perfect golden floor lamps that are perfect to give your living room a luxury feeling! The thing is: these are some of our favorite classic floor lamps designs, created by great designers from the past but also from the present. One thing we can guarantee: it will be hard for you to choose your favorites! Stardust Floor Lamp is a mid-century modern revolving lamp inspired in stellar orbits. Constructed out of brass tubing into a rounded oblong shape, it shines brightly due to the light cast by the bulbs arranged in the same way as a candelabra. Ideal for a big classic dining room as well as in a modern living room, it will bring an astral beauty to your space. Janis Floor Lamp is a contemporary ﬂoor lamp which recovers the golden jazz spirit of the 60’s. This ﬂoor lamp was designed to make a powerful stance, turning any place into a classic majestic setting. With a very mid-century feeling, this simple floor lamp with a few golden finished is beautiful and will turn your living room design into a nostalgic den. Another great design by Lambert et Fils, the Grue Floor is also very simple and mid-century enough to make us fall in love with it! This outstanding piece has eight spotlights which offer a soft lighting, attributing simultaneously a cozy and sophisticated ambiance to any setting. Click here to know more. 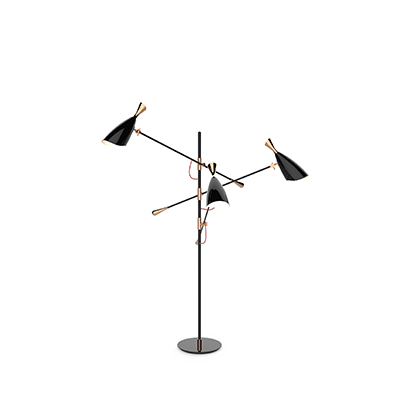 A very minimalist and iconic piece, this standing lamp by Cesare Lacca Attributed will look great in an industrial living room or even a Scandinavian inspired space! What could be better than a golden floor lamp? A golden floor lamp with pink appliques! And here you have it! Majestic! And because classics are always worth it, fall in love with this tripod floor lamp with amazing golden finishes!